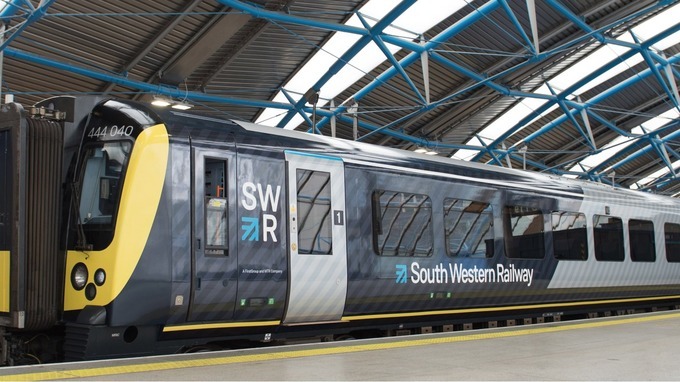 South Western Railway has launched its brand with a newly-liveried train and 100,000 half-price advance tickets for passengers. Waiting at platform 21 of the Waterloo International Terminal to greet the Class 444 train as it pulled in were: Chris Grayling, Secretary of State for Transport; Andy Mellors, Managing Director for South Western Railway; and stakeholders from across the network. As well as showing off the new brand, South Western Railway announced that 100,000 half-price advanced tickets for passengers were made available from today (Monday 4 September) to buy online. The offer includes travel to and from areas such as London Waterloo, Exeter, Bristol, Bath Spa, Weymouth, Bournemouth, Salisbury, Portsmouth Harbour and the Isle of Wight. “We are delighted to introduce our new brand today with the first fully-liveried train pulling in to the Waterloo International Terminal - a fitting setting for such an event as it will be an integral space for our plans to deliver longer trains and more capacity for passengers. “It was great to officially launch the brand in front of key stakeholders from across the network and many of our South Western Railway employees. We’ve had a challenging couple of weeks with the completion of the August Waterloo upgrade works but we’re now looking to the future. “Between now and 2024, we will be investing more than £1.2 billion on new and refurbished trains, station improvement projects and the simplification of tickets. “This is the start of a new era for people who use trains on the South West route. “We are determined to improve journeys for passengers and under this deal passengers on South Western Railway will benefit from faster journeys, 90 new trains and more than 50,000 extra seats in and out of Waterloo each day during rush hour. “We are delighted to launch a fresh and exciting brand today for our newest rail company South Western Railway. Together with our partners MTR, we are really pleased to have the responsibility of running a key part of the country’s rail network on which millions of people rely every week. 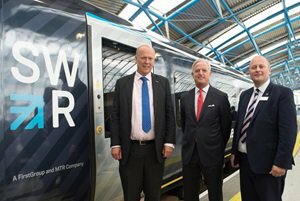 “Our experienced leadership team, working alongside thousands of our dedicated SWR colleagues, will deliver the tangible improvements that customers and stakeholders told us they want including new and better trains, more seats and services, quicker journey times, improved stations and more flexible fare options."